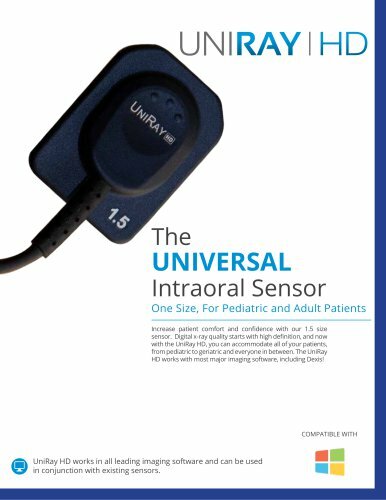 Intraoral Sensor One Size, For Pediatric and Adult Patients Increase patient comfort and confidence with our 1.5 size sensor. Digital x-ray quality starts with high definition, and now with the UniRay HD, you can accommodate all of your patients, from pediatric to geriatric and everyone in between. The UniRay HD works with most major imaging software, including Dexis! COMPATIBLE WITH UniRay HD works in all leading imaging software and can be used in conjunction with existing sensors.